The European Bank for Reconstruction and Development (EBRD) has provided a UAH 324 million four-year loan (equivalent to EUR 10 million) to OTP Leasing for financing long-term leasing transactions with Ukrainian small and medium-sized enterprises (SMEs). 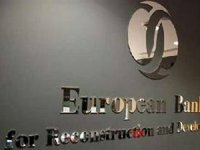 The new loan of the EBRD would allow the company to extend the term of leasing contracts the company offers and sign them in local currency, as well as diversify its client base, first of all thanks to focusing on smaller companies, the bank said. The bank said that SMEs would also benefit from the hryvnia-pegged financing in the amount of up to EUR 1 million provided under the European Union's EU4Business initiative makes it easier for SMEs to get finance and benefits from the free trade area between Ukraine and the European Union. The grants will be provided to SMEs meeting the requirements as investment incentives to reduce the cost of their capital investment into modernization of technological and industrial processes in line with the European Union's standards, the bank said. OTP Leasing belongs to Hungary's OTP Bank Plc. It has been operating on the Ukrainian market for 10 years.